Orbbec Astra SDK 2.0.9 Beta3 is available to download. And the Body Tracking SDK license has been extended. Sorry for the delay. Please visit the link below to download our latest SDK. There is a small issue on the Unity package, Scene 3. If the character isn't moving in your scene, it's because de function PoseUser.OnNewFrame is not called. 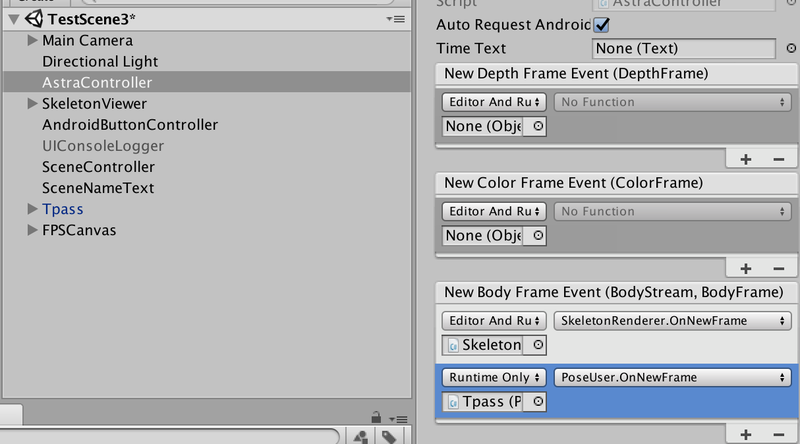 If you look at the AstraController GameObject you'll see that the function is missing. But can I access RGB and Depth camera of Astra Pro using this new SDK? I downloaded the Linux version (you know, the platform that is generally recommended for your persee product) and the documentation still doesn't even mention the linux platform. Please try harder.